I looked at VNQ (Vanguard REIT ETF) just now and noticed the dividend yield is at 4.21% as I write this. Thats a bit higher than I recall seeing it. 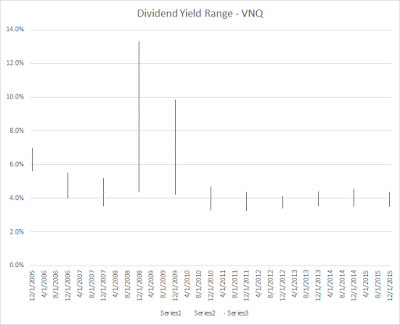 The dividends you get from VNQ will vary because the dividends of the REITS it holds vary. The price you pay for VNQ will also vary but because its traded on the open market and its market value fluctuates. The yield you get from VNQ will depend on what you paid and what the combined dividend of the REITs happens to be. I pulled the high and low trading value of VNQ for the 2005 to 2015 period (all off Yahoo Finance VNQ). I also summed up the annual dividend payment for those years. 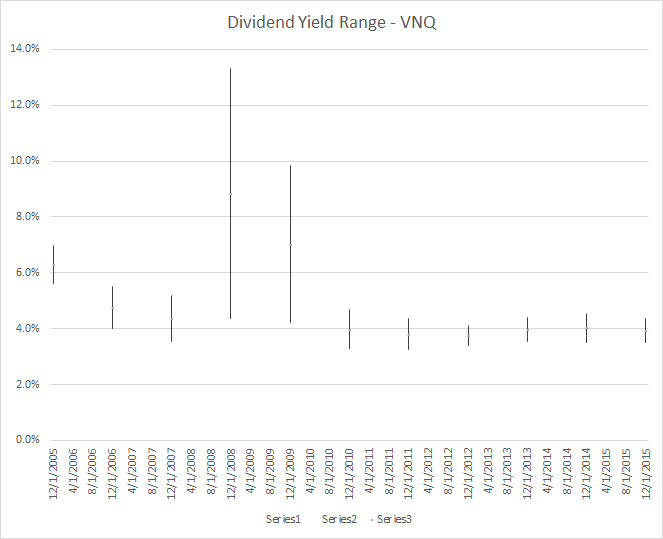 Between these I figured the range of dividends you'd get if you bought VNQ in each year. For example: in 2005 the ETF traded between a low of $51.12 and a low of $63.45. The dividend total for 2005 was $3.56. If you bought at the low or high your yield would be 5.6% or 7% respectively. The yields in 2008 and 2009 are higher for people who bought VNQ at cheap prices after the market crash. In the past 5 years the dividend yield averaged 4%.